Today, stiff online competition means savvy business owners need to pay close attention to the best ways to attract new customers. 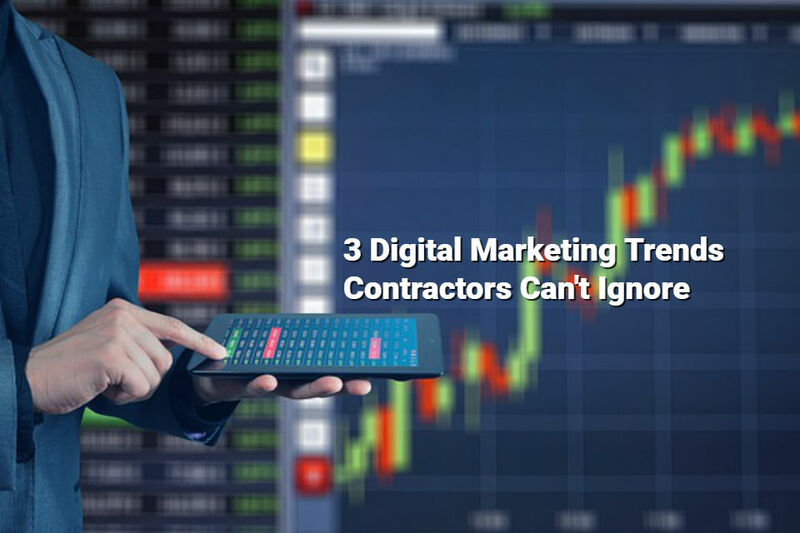 Whether you manage a home remodeling business, a painting company, a plumbing firm, or an HVAC repair service, you’ll want to know about the latest marketing trends for contractors and how you can stay ahead of the game. Today, most people acknowledge the vital importance of online marketing for small businesses. Promoting goods and services on the web enables entrepreneurs to reach interested customers 24 hours a day. Yet some service companies still hesitate to promote their services online. By channeling a portion of their marketing time and budget into digital media, these businesses can tap into a much wider audience for a fraction of the cost of traditional advertising and much quicker than waiting for word of mouth. Indeed, launching a successful Internet marketing campaign can help companies lower advertising expenses while generating new customers. This all sounds good in theory, but how can small businesses create a truly local online presence? The Internet attracts a massive global audience. In the past, some companies encountered challenges using this resource to attract paying customers at the local level. Today, many online directories list businesses offering their services within local areas. These sites resemble old-fashioned telephone directories in a way, but they usually contain considerably more detailed information. By making certain you list your plumbing or home remodeling business in a local directory, you’ll advertise your presence to customers in your area. Since many people pay close attention to reviews about companies posted on these websites, you’ll want to check the directory frequently. Examples of these types of sites include Google My Business, Houzz, Porch, HomeAdvisor, Amazon Home Services, Thumbtack, and Yelp. Keep in mind some of these directories require a listing fee, so you may want to ask other contractors in your area which of these sites have been most successful for them. In addition to these national websites, numerous directories exist for specific cities and regions, so you may want to do a few quick searches on Google to see if there are any popular local directories that list contractors. Knowing that potential customers are reading these reviews, it pays to have a plan for getting reviews built into your business processes to encourage your happy customers to leave reviews across all these platforms. Check out our post on how online reviews can make or break a business to learn more. When it becomes available in your local area, if it’s not already, Google Home Services will provide service companies to manage local ad campaigns. Google Home Services is currently available in some cities (including New York City, Los Angeles, Seattle, and Chicago), and it offers a great way for contractors to generate leads. One advantage offered by Google Home Services involves the use of ads on Android and iOS operating systems. You can log into your account conveniently using your mobile phone to manage your ads. If you discover you spend many hours on the road traveling from one work location to another during the day, this capability offers advantages. For example, you won’t need to return to the office to contact new customers. The Home Services interface provides significant control over the information displayed to prospective customers but using the platform will cost you money for each lead you generate. So, do your homework before diving head first into this one. A few years ago, Google generated many headlines when it changed the way it ranks websites during online searches. The new search engine ranking system announced in 2015 places a much higher priority on websites which display well on both personal computers and mobile devices. Contractors who make certain their company websites serve customers using smartphones and tablets gain an advantage as a result. Sometimes people who specialize in different trades, such as plumbing or electrical contracting, don’t realize the company’s website may display perfectly on a personal computer, but poorly on a smartphone. It makes sense to check the way your company’s website appears from time to time. Google also offers a free tool that lets you test pages to see if Google considers them mobile friendly or not. Why should contractors consider investing or upgrading their websites to be accessible to mobile phone users? For the same reason Google made it a focus. The truth is more people access the internet via their phones today than they do on computers. If your website won’t display well on a small screen, you likely won’t rank well on Google and the visitors that do reach your site will likely leave quickly when your site doesn’t display correctly. At JobFLEX, we’ve helped thousands of contractors improve their businesses with our invoice and estimate app. We’ve seen firsthand just how big of an impact by knowing how to choose and use software, apps, their own websites, and online resources like Google Home Services. While there will always be new trends, you’ll need to keep your eye on the three listed above as they can be difference makers for your business in 2019.